Pointwise, Inc. has been involved in various AIAA sponsored workshops in the past including High Lift, Drag Prediction, and more recently Sonic Boom Prediction workshops in order to further develop a set of best meshing practices for each respective application area. Doing so also helps us to better understand the unique behavior of many different computational fluid dynamics (CFD) solvers and their particular requirements from a meshing perspective. Is there some insight to be gained by closely coupling meshing techniques with a specific solver's numerics to improve solution accuracy or convergence? Where should cells or nodes be clustered for a given solver or application? What types of cells should be used? In short, we learn a lot from participating in these workshops–expertise that we can then pass along to our users. The Propulsion Aerodynamics Workshop extends our involvement to yet another application area of interest. The 3rd AIAA Propulsion Aerodynamics Workshop (PAW) preceded this year's 52nd Propulsion & Energy conference hosted in Salt Lake City, Utah. The workshop is organized by the AIAA Air-Breathing Propulsion System Integration Technical Committee and is focused on assessing the accuracy of existing computer codes and modeling strategies in simulating flows of interest to the propulsion community. The workshop provides an impartial forum to present numerical results with measured empirical data for benchmark inlet and nozzle cases, exchange ideas, and evaluate the effectiveness of CFD codes and modeling techniques. In this year's workshop, there was a departure from the benchmark cases that were used in previous workshops. The organizing committee was interested in using test cases where the empirical data and model definitions were more open and easily accessible. As a result, new inlet and nozzle configurations were introduced. The inlet test case is a serpentine inlet provided by a NASA contract that investigated the effects of boundary layer ingestion and flow control techniques on inlet system performance. The work is summarized in NASA CR-2011-217237. One of the nozzle test cases, the Dual Separate Flow Reference Nozzle (DSFR) developed by ASE FluiDyne, was actually a carryover from earlier workshops, but another test case, referred to as the Dual Mixed Flow Reference Nozzle (DMFR), was added for this year's workshop to provide participants a blind-study option where test results were unavailable to participants prior to submitting their numerical results. 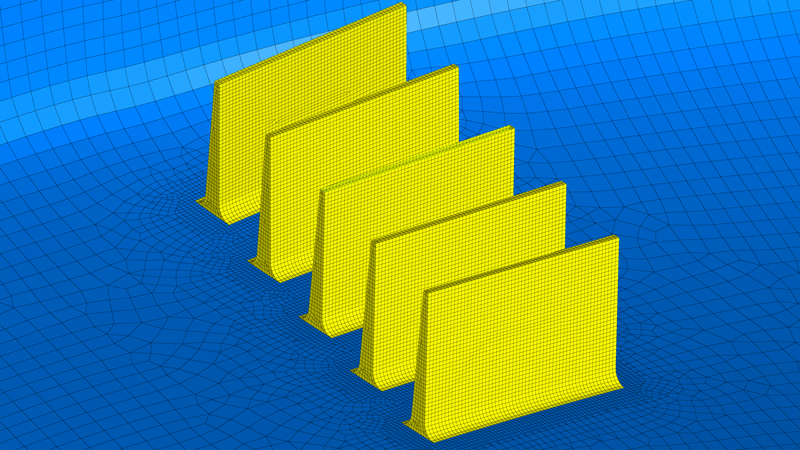 The models for each benchmark case were provided via neutral CAD formatted files by the workshop for participants who were interested in developing their own meshes, but Pointwise also created a set of standard grids for workshop participants featuring both multi-block structured and unstructured meshes. Overall this year's workshop had 20 participants present results with an even split of submissions provided for the nozzle and serpentine inlet test cases. The serpentine inlet used is from the Inlet Flow Control and Prediction Technologies for Embedded Propulsion Systems (IFCPT) NASA technical report. Test data was acquired at Georgia Tech's Transonic Tunnel. Airflow was induced from ambient room conditions through the diffuser by creating low pressure downstream with a vacuum pump. Flowrate was controlled by running the pump at selected RPMs while measured with a calibrated Mass Flow Plug (MFP). 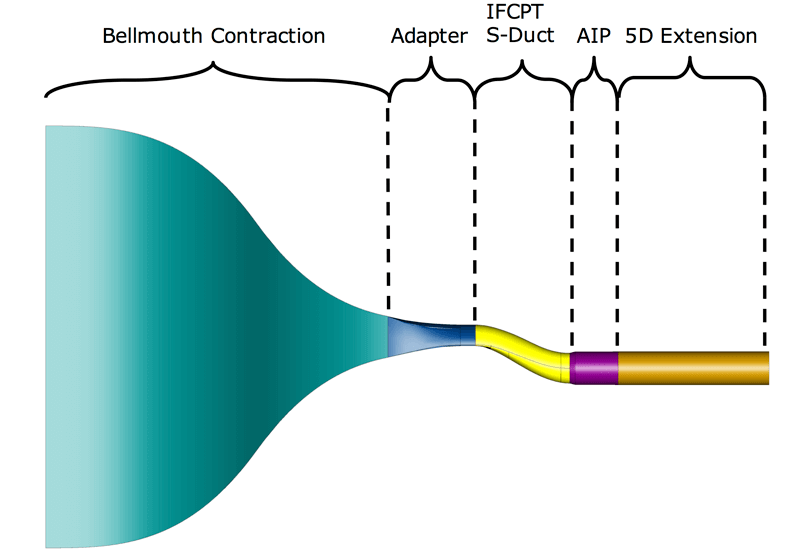 The test case modeled the bellmouth contraction, upstream adapter section, IFCPT S-Duct, Aerodynamic Interface Plane (AIP) housing, and 5-diameter extension as depicted in Figure 1. Figure 1: IFCPT S-Duct integrated in the Georgia Tech Transonic Tunnel. The AIP diameter (D) measures 5 inches, is offset 1.09(D) in the vertical direction, and has a length-to-diameter ratio (L/D) of 3.106. The model has a 5D extension added in order to impose a downstream constant pressure or mass flow boundary condition. For the uninitiated, serpentine inlets are typically used in hybrid wing body aircraft with embedded engines in order to help mask the aircraft's radar signature as part of a more comprehensive shaping strategy. The engine sits offset in the vertical direction from the inlet opening in order to reduce or re-direct reflections from incident radar waves. The turn, characteristic of these types of inlets, introduces an adverse pressure gradient that has the potential to separate flow at certain flow conditions. This separation can cause a number of undesirable effects including total pressure loss, increased inlet distortion, and noise. Inlet designers typically weigh the trade-offs associated with how severe this turn becomes before separation occurs with the overall length of the inlet—something that influences the overall weight of the system. The workshop outlined three configurations participants could choose to investigate in order to help characterize their influence against the baseline, clean inlet configuration. The two other configurations are illustrated in Figure 2. The first includes the AIP rake and probe instrumentation while the second adds a set of vortex generators located just upstream of the inlet turn. Including the AIP instrumentation effectively corrects the streamwise cross-sectional area distribution through the inlet. Without this instrumentation modeled, as in the baseline inlet configuration, there is a discontinuity where a sharp rise in the inlet’s cross-sectional area results. This discontinuity introduces a small pocket of flow separation that is not normally present in the test configuration where the AIP instrumentation is included. Vortex generators are typically added to prevent flow separation from occurring by energizing the boundary layer ahead of an adverse pressure gradient region. However, in this case they are actually used to make the flow characteristics of the inlet worse. Experimenters discovered during the test that the inlet flow was not separating in the turn as they had anticipated. In order to simulate undesirable conditions, they introduced vortex generators to induce flow separation. Figure 2: AIP instrumentation and vortex generators were modeled in separate configurations to determine their influence on inlet performance metrics. Participants were asked to provide total pressures at locations corresponding to those used by the standard 40-probe total pressure rake from the test in addition to a number of rake and wall static pressure locations. The total pressure values were then used to calculate a total pressure recovery at the AIP as well as inlet distortion – a metric that essentially defines the derivative of total pressure values measured between each probe. Steady-state Reynolds Averaged Navier-Stokes (RANS) results were provided in prior workshops, so participants at this year’s workshop were encouraged to submit results from unsteady simulations. The Dual Mixed Flow Reference Nozzle (DMFR) configuration consists of co-annular core and fan flows which are mixed together through a simple splitter nozzle, or annular mixer, before the flow exits from a common nozzle throat. The nozzle model includes pressure rakes in both core and fan flow streams in addition to a number of structural support pylons. The nozzle exhausts into a farfield plenum at prescribed ambient conditions without a ground plane. The DMFR model is depicted in Figure 3. Figure 3: The Dual Mixed Flow Reference Nozzle (DMFR) model. For the nozzle, participants were tasked with providing thrust and discharge coefficients for seven fan-to-ambient pressure ratio conditions using a constant extraction ratio (PT f an/PTcore). 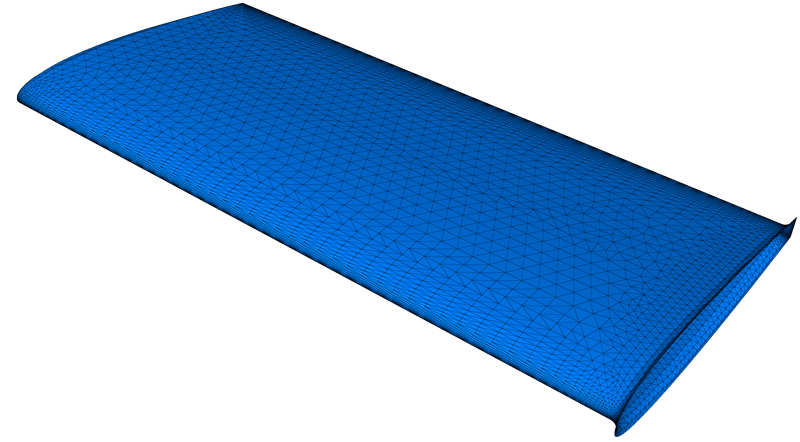 Table 1 shows the standard set of meshes Pointwise provided to participants for the workshop. All meshes, with the exception of the S-Duct with AIP instrumentation, are half-symmetry models. Mesh quality for this configuration showed improvement when the full model was used over a half model in regions near the rake probes along a constant y = 0 plane. The set of structured meshes used the hyperbolic extrusion capability in Pointwise to advance structured hexahedral cells normal to the inlet wall surfaces. This provides a uniform boundary-layer-resolved mesh spanning the entire length of the duct. An interior block is formed from the domains at the extent of the normal extrusion and those created along the symmetry, inlet, and exit domains of the control volume using transfinite interpolation. Smoothing is applied to the interior volume cells using Pointwise's elliptical solver. This approach allows hexahedral cells to smoothly transition from a square shaped cross-section at the bellmouth opening to a circular cross-section at the AIP as shown in Figure 4. Figure 4: Multi-block structured mesh for the baseline S-Duct configuration. The set of unstructured grids for the baseline S-Duct configuration attempted to maintain a surface grid spacing similar to those used in the family of multi-block structured grids, so that some comparisons between structured and unstructured meshes might be derived. The unstructured surface meshes also use a new advancing front quad-dominant surface meshing algorithm implemented in an upcoming V18 release of Pointwise. 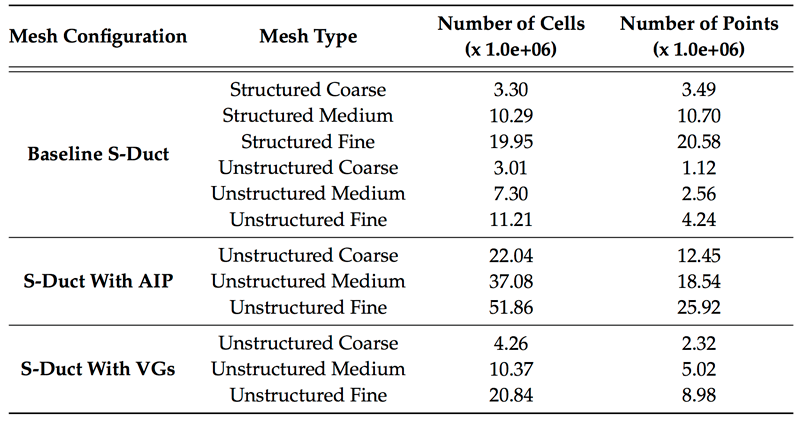 Unfortunately, this approach leads to unstructured meshes that have far fewer cells and points than those used in the corresponding set of structured grids as shown in Table 1. Using Pointwise's anisotropic tetrahedral extrusion (T-Rex) advancing layer technique to extrude stacks of right-angled tetrahedra normal to the inlet wall boundaries, which are subsequently combined into stacks of hexahedra and prisms, helps create boundary-layer-resolved meshes highly reminiscent of structured grids (See Figure 5). Table 1: Set of standard Pointwise S-Duct meshes provided to PAW participants. 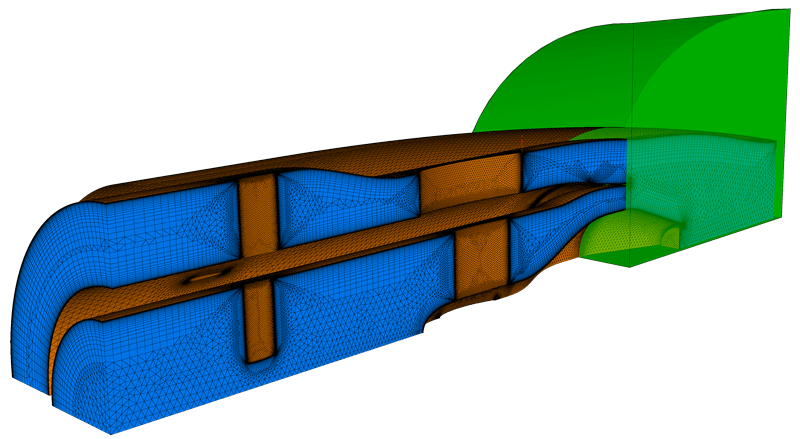 Figure 5: Pointwise's T-Rex creates highly structured boundary-layer-resolved grids between two structural support pylons and nozzle centerbody. However, the cell volumes inflate more quickly than those of the structured family of grids resulting in far fewer cells and points, which will be corrected in an updated release of grids for participants to use going forward. Figure 6: Advancing front quad-dominant surface mesh for the AIP instrumentation. 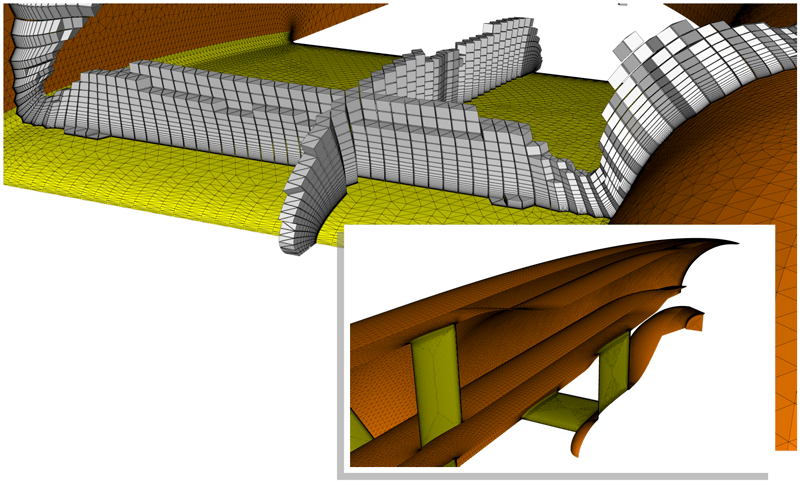 The S-Duct with AIP instrumentation as well as the S-Duct with VGs mesh configurations also use the new advancing front quad-dominant surface meshing algorithm soon to be available for users. Examples of the surface meshes created using this algorithm for these complex geometry cases can be seen in Figures 6 and 7. Table 2 shows the set of 3-D and 2-D DMFR nozzle grids provided to participants. The 3-D DMFR nozzle grids are quarter-symmetry representations of the full nozzle geometry. The table highlights that when creating multi-block structured meshes, sometimes grid refinement added to resolve a small feature of a model (i.e. trailing edges, fillets, etc.) propagates to other regions in the control volume where such cell clustering is not necessarily needed, but remain in order to ensure the structured topology is balanced. The unstructured set of grids were created using a similar strategy as was already mentioned with the S-Duct meshes wherein the surface edge spacing was applied to be consistent with the surface grid spacing used in the multi-block structured family of grids. Again this results in meshes that are too coarse for comparison between structured and unstructured grid families. Figure 7: Advancing front quad-dominant surface mesh for the vortex generators. Table 2: Set of standard Pointwise DMFR nozzle meshes provided to PAW participants. To resolve the highly curved surfaces around leading and trailing edges of pressure rakes and structural support pylons in both unstructured nozzle and inlet cases, anisotropic triangles and quads were applied using 2-D T-Rex in Pointwise as depicted in Figure 8. Figure 8: 2-D T-Rex applied to a pressure rake's leading and trailing edges for the DMFR nozzle helps resolve highly curved surfaces with anisotropic triangles. Pointwise V18 includes new features for quickly creating shapes—boxes, cylinders, spheres, and so forth. These shapes can then be used as sources to define sub-regions in the mesh volume where additional volume grid refinement can be applied. In the case of the DMFR nozzle geometry a quarter-symmetry cylinder was placed between the nozzle’s mixing and exit planes to refine the mesh in the region where mixing occurs as illustrated in Figure 9. Figure 9: Sources in Pointwise V18 applies grid refinement between the mixing and exit planes of the unstructured DMFR nozzle grids. 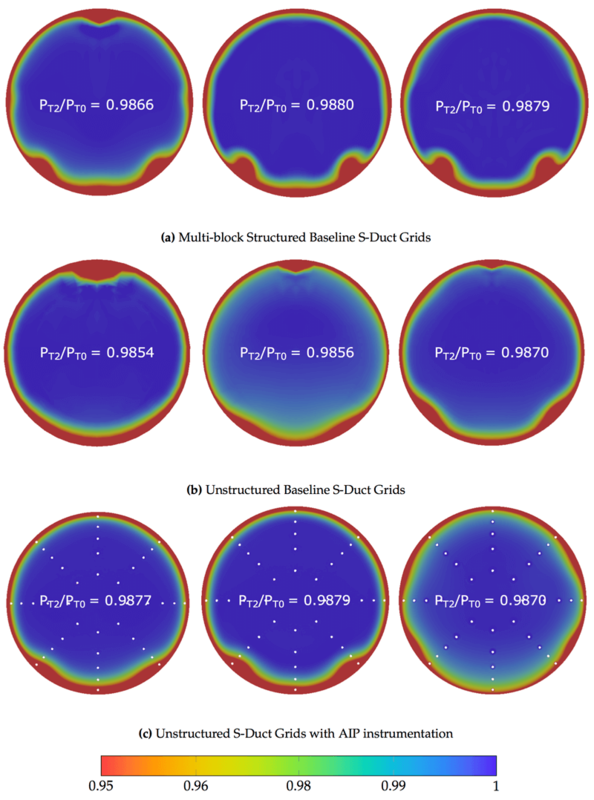 In addition to providing the standard set of grids for workshop participants, Pointwise supplied steady-state results for the various S-Duct configurations. Solutions were run using FUN3D v12.9, a compressible, node-based finite-volume solver developed at NASA Langley. 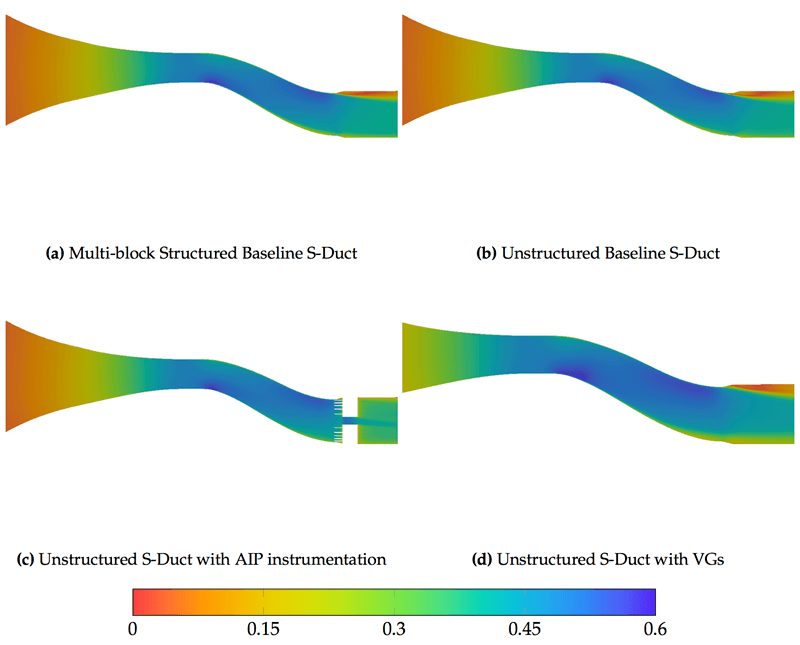 The baseline S-Duct and S-Duct with AIP instrumentation test cases were run using Flow Condition 1 while the S-Duct with VGs case were run using Flow Condition 3 as listed in Table 3. Table 3: Flow conditions for S-Duct results submitted to PAW. Flow Condition 1 corresponds to conditions used for the baseline S-Duct and S-Duct with AIP instrumentation. 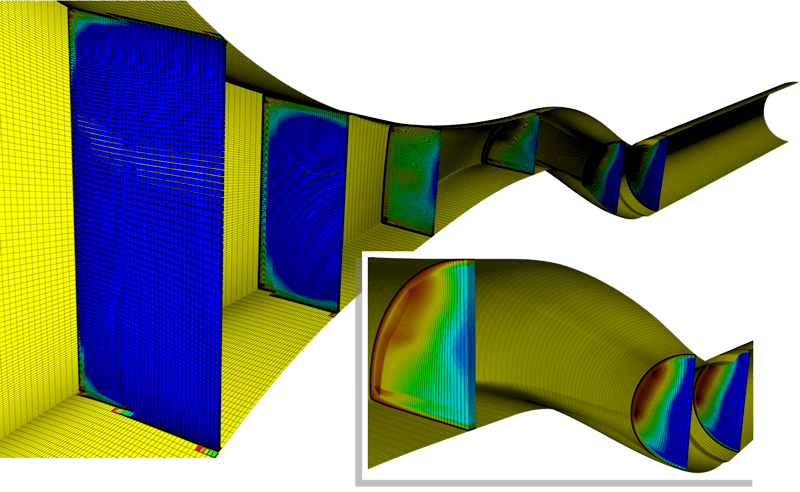 Flow Condition 3 was used in results for the S-Duct with VGs configuration. Total pressure and total temperature were prescribed at the inlet boundary while a target mass flow was given at the control volume exit. Adiabatic no-slip wall conditions were applied to all S-Duct wall boundaries A constant y-symmetry boundary condition was applied along a constant y = 0 plane for half-symmetry cases. These boundary conditions are illustrated for Flow Condition 1 in Figure 10. Figure 10: Boundary conditions for Flow Condition 1. Figure 11 shows grid convergence resulting from the various S-Duct configurations run. Here N2/3, where N corresponds to the number of grid points in the mesh, is a substitute for the square of the characteristic grid spacing. For a 3-D problem N1/3 is an estimate of this characteristic grid spacing. Formally, for a second order scheme, there is a linear change expected in error versus the square of grid spacing in the asymptotic range of grid convergence, and the linear slope is an indication of order of accuracy for the simulation. Looking at these plots it is apparent that the asymptotic range is not approached, and additional grid refinement is needed. Furthermore, the meshes should be consistently refined. As discussed earlier, an attempt to keep the surface grid spacing between structured and unstructured mesh refinement levels consistent was made, but this strategy left the unstructured grids too coarse. Figure 11 further reinforces this notion. Figure 11: Grid convergence for the various S-Duct configurations. Figure 12 shows Mach contours plotted at a constant y = 0 plane for the fine grid of each respective S-Duct configuration. In the absence of the AIP instrumentation, the large cross-sectional area change causes a separation to appear immediately downstream of the AIP. Figure 12: Mach contours plotted at a constant y = 0 plane highlights a separation immediately downstream of the AIP in the absence of AIP rake instrumentation. Figure 13 shows total pressure recovery contours plotted at the AIP for all of the baseline S-Duct and S-Duct with AIP instrumentation cases. Notice that in all of the unstructured baseline S-Duct grids as well as in the coarse structured case that an additional low pressure region appears at the 12 o'clock location. These grids are capturing the separation that occurs immediately downstream of the AIP as illustrated in Figure 12. This low pressure region disappears as the mesh is refined, and its visibility in the coarser grids suggests that the cells neighboring this separation are too large. Furthermore, the unstructured baseline S-Duct cases fail to sufficiently resolve the small vortices appearing at 5 and 7 o'clock positions. Here insufficient grid resolution plays an important role in solution accuracy as flow gradients exist immediately upstream and downstream of this plane where results are being surveyed. Figure 13: Total pressure recovery contours plotted at the AIP for the various S-Duct configurations. Coarse, medium, and fine grids are shown from left to right for each configuration. Finally, there were wall static pressure taps installed at several locations along the S-Duct walls, and solutions were surveyed at each location. Static pressures plotted for each pressure tap are shown in Figure 14 for each respective case. 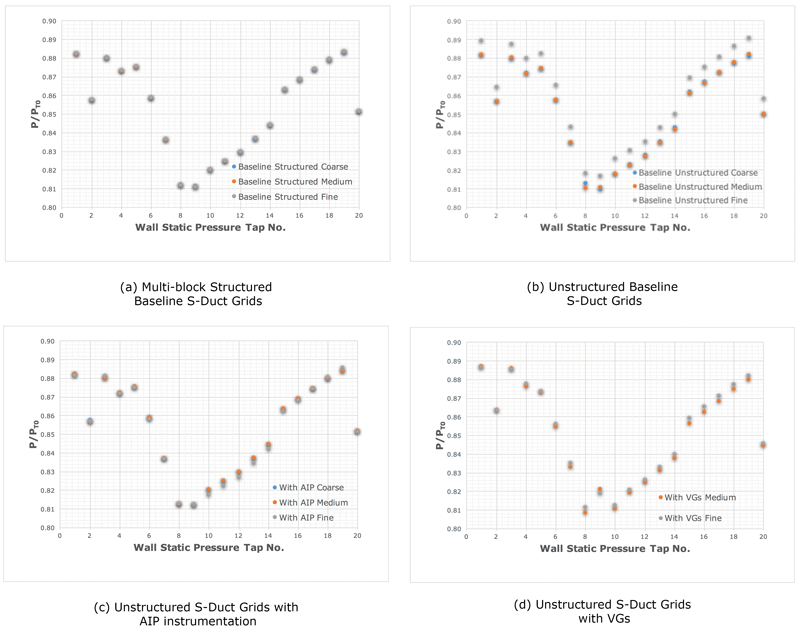 Results for the multi-block structured grids appear to be aligned with each other; however, there is substantial scatter in the results for the unstructured grid cases. 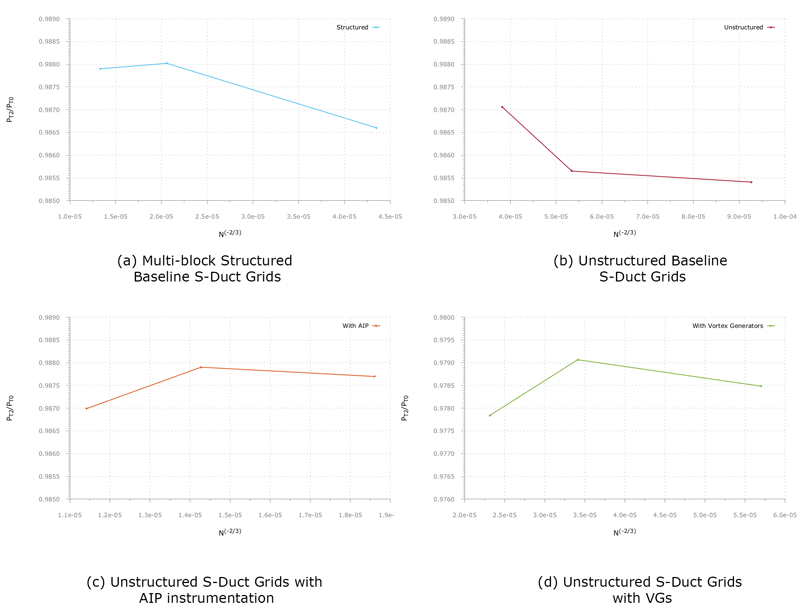 The scatter in results for the unstructured baseline S-Duct set of grids further reinforces the need for additional grid refinement. Figure 14: Static wall pressures for the S-Duct Configuration. With the introduction of new test models at this year's Propulsion Aerodynamics Workshop, there is still some work left to be done in defining a consistent set of meshing guidelines in order for participants to be able to generate mesh independent solutions. Typically, the requisite feedback about the suitability of meshes that have been created is not available until solutions have been produced. With the workshop's emphasis on submitting unsteady results, it is important to strike a balance between having grids that provide mesh independent solutions, but also are not unnecessarily refined such that they become too large and discourage participants from attempting to run unsteady simulations. At the end of this year's workshop, the collective results from participant submissions were compiled and showed favorable agreement with test results despite using a mass flow being slightly off due to the manner in which the values were calculated during the test. Several participants predicted total pressure recovery within 0.25 percent of the empirical value and were within 0.5 percent of the empirical distortion metrics based on the 40 probe rake pressures. For the DMFR nozzle case, empirical data is not yet available, but should be forthcoming. On the meshing front, a couple of additional mesh refinement levels are to be released for participants in order to ensure grid independence, while additional work continues on how to best ensure grid families are created appropriately. Typically, one would create a fine mesh – as fine as computational resources allow – and sequentially remove every other point to define consistently coarser mesh refinement levels. This should be relatively straightforward for a multi-block structured grid, but doing so for an unstructured mesh is not quite as simple. To follow the progress of participants, or get involved, visit the Propulsion Aerodynamics Workshop website. To learn more about the new features available in the upcoming Pointwise V18 release, and discussed in this article, visit www.pointwise.com or register for our upcoming Pointwise User Group Meeting on 21-22 September in Fort Worth, TX.